In a letter to the Property Council a retirement village resident of 11 years has criticized the proposal of the retirement living industry to establish an industry Code of Conduct. The code is voluntary and the only punishment for not upholding the standards espoused in the code is, after repeated breaches, to have the name of the organisation removed from the code. "Thank you for the opportunity to make comment re a 'Retirement Living Industry Code of Conduct'. Although admirable to some within the retirement living industry, an aspirational code of conduct is no substitute for consumer protections under law. If there is to be a code it should only be a short, sharp commitment to operate lawfully, morally and ethically. Only legislation and then regulators ready to enforce that law can truly protect retirees. An industry ombudsman is of the greatest need with fast, affordable, decisive enforcement of that law. Not even a not-for-profit operator has been a guarantee of ethical or lawful behaviour within the retirement living industry. History has recorded self regulation as a fail and although we may self regulate with the best of intentions, the dark motivation to step over the line of morality and legality comes from a basic human weakness. A weakness to firstly protect or advantage oneself at the cost of another, and secondly in many cases a weakness to protect or advantage the organisation one serves at the cost of many. The aspiration to a retirement living code will last as long as the desire to advantage the resident is in the best interest of an individual operator, when the opposite is true the code will often most assuredly fail. Only the strength of the written law together with a ready and simple path to justice, such as an industry Ombudsman, will see the rights of residents truly protected and where necessary redressed. Anything else is in my personal view simply a mechanism to divert the eyes of the legislator away from the need to legislate. If the objective of the code is to help elevate the currently held poor community view of the industry, then the industry must join with residents and their representative bodies and drive legislative reforms that truly protect retirees. It is what is actually happening to village residents that is driving down the reputation of the industry. The community not just residents are shocked at the lack of legality and morality in the operations of some, will the code truly drive improved legality and morality amongst operators. Improved legislative protections for residents however will generate greater confidence in the industry, confidence in both those coming baby boomers thinking of moving toward this sector and of course just as importantly their family members. A new found confidence that could propel the Australian industry closer to the penetration levels seen overseas. Good operators are seeing the retirement living industry trashed by bad operators, of all the times operators and retirees should share a singular desire of a better industry it should be at this point in time. A Retirement Living Industry Code of Conduct may give some industry players a warm and fuzzy feeling, but it makes zero, zero contribution to tangible protections for retirees. The industry, not just residents, should be campaigning for an Ombudsman in every state. No modern responsible industry should be afraid of the law nor be ready to hide behind any weaknesses in it. If an industry has to write down to remind itself to operate lawfully, morally and ethically then that industry has already failed both their customers and the community generally. To be a respected industry you don't aspire to ideals, you live them. 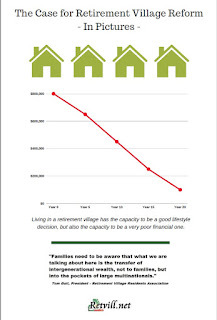 A flattening or flat property market spells danger for many retirement village residents. Many retirees are dependent on capital gain in the value of the village unit they occupancy to offset the reducing value of their initial capital amount. Monthly fees, inflation and the deferred management fee all work to reduce the capital value held initially by the resident. Capital gain is their only defence. The following table shows that occupancy in villages where the operator grants capital gains to the residents can gain significant defence if not advancement on their initial capital expenditure. However the area highlighted in red shows that where there is no capital gain between entering and exiting the village, the reduction in the refundable amount can be dramatic in comparison to those with more historic capital gain rates. The ability of the resident to fund their own aged care placement can suffer badly over time from this outcome. In a flat or flattening property market a retirement village contract that offers capital gain to the resident may afford no protection from the ongoing fees and inflationary impact over time on their initial refundable amount. "A proposed merger of aged care homes Kellock Lodge in Alexandra and St John’s Village in Wangaratta – where 10 residents died in last year’s flu outbreak – has Alexandra locals voicing their opposition at a community meeting. 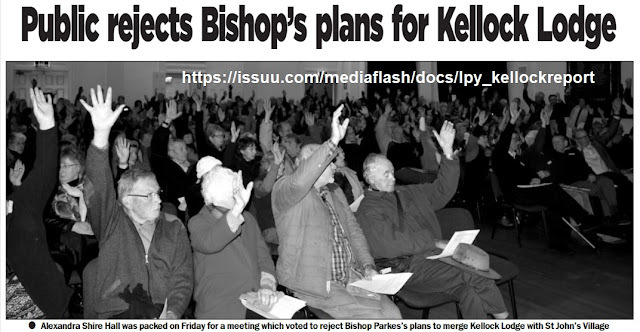 They have been backed by three of Kellock’s eight directors in a public letter, stating that given the facility has $9 million in the bank, the accreditation issues have been resolved and the community support, there is no “reasonable or defendable rationale” to support the merger." The push continues to revise the definition of a retirement village in the Victorian Retirement Village Act 1986 to make all cost inclusive residential tenancy contracts the mandatory first offer. This will provide transparent and thereby lower cost rates for future retiree lessees. Would allow retirees to rent, when they do not have the capital to loan interest free to the developers. It will introduce free market competition. It will free up family housing in the community. Should increase the retirement village uptake rate presently quoted at 5.7% of over 65 year olds compared to 15% in the USA. The NSW government has made a change to their act which allows residential tenancy within a defined retirement village. The main area of contention is that retirees must pay an in-going contribution that in Victoria cannot be rent. The phrase 'cannot be rent' has been removed from the NSW Act. Victoria is lagging behind New South Wales in regard to a residential tenancy agreement within retirement villages. The Victorian legislation defines the ingoing payment by 'whether in a lump sum or by instalments but does not include rent', accommodation by way of a residential tenancy cannot be offered by the operator. NSW legislation does not include the phrase 'but does not include rent' thereby allowing an operator to provide accommodation in a defined retirement village by way of a residential tenancy agreement. There has been long term grass roots advocacy in Victoria for an amendment to the legislation. In related articles both The Courier and The Weekly Source report on a fire in a retirement village in Creswick Victoria, one unit was destroyed and two others damaged. The articles point out the heightened dangers from fires in villages and the need for full safety measures inclusive of an evacuation plan and an evacuation assembly point. Currently in Victoria there is no legislative requirement for a retirement village operator to have an emergency evacuation plan or an emergency assembly point. An article in the Sydney Morning Herald by Rachel Lane of Aged Care Gurus sets out some very important distinctions between an Aged Care facility and a Retirement Village. "The first lesson in this story is that retirement villages and aged care facilities are not the same thing. 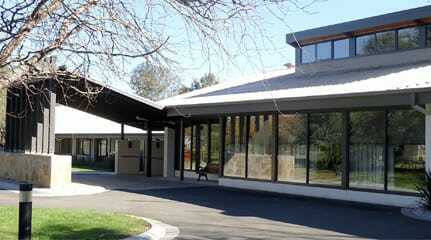 Retirement villages operate under completely separate, state-based rules, while aged care facilities operate under federal legislation. The rules governing their legal and financial arrangements are as different as apples and oranges. Just because you are a resident of a co-located village doesn’t necessarily give you priority or make you the “next cab off the rank. " Retirement Village reforms have been a hot topic since the ABC 4 Corners program 'Bleed Them Dry Until They Die' in 2017. 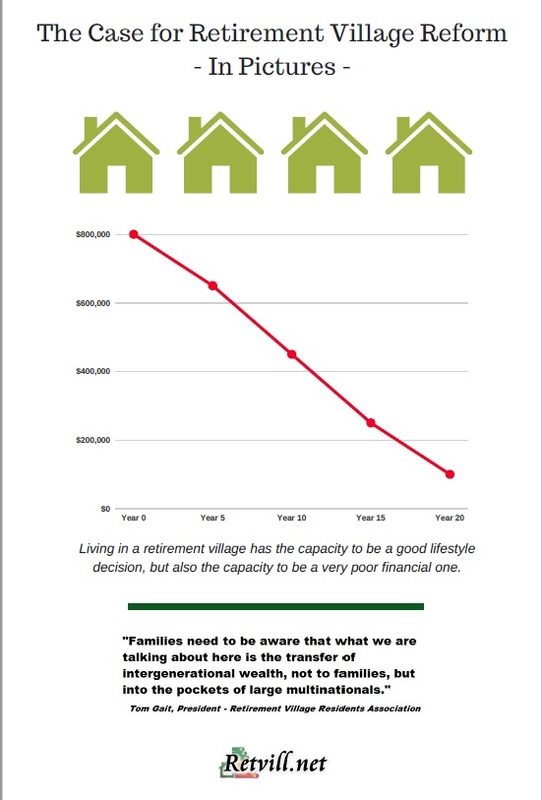 This 15 page e-book shows the need for retirement village reforms by showing the financial impacts upon retirees on entering a retirement village more in pictures (tables) rather than words. According to AARP, the vast majority of elderly Americans are intent on remaining in their homes and statistics bear that out: 90 percent of them have a plan for aging in place. 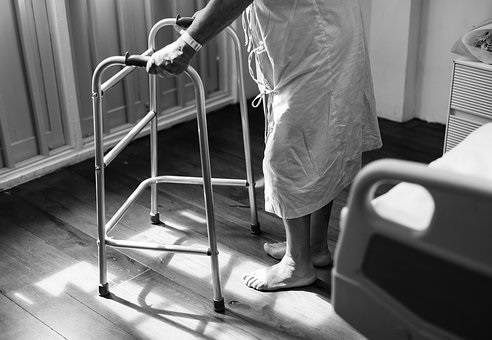 While many may eventually require some form of assisted living or residence in a care facility, older adults can remain and thrive in their homes with a few accessibility modifications that can help eliminate the potential for falls and other injuries. In addition to safety, such modifications can add comfort and convenience and make activities of daily living easier to perform for seniors who may struggle with activities that once came easily to them. If you or a loved one has need for a wheelchair, it’s important for their accessibility to ensure that doorways and hallways are wide enough to allow for easy passage and maneuverability. It can be an expensive and time-consuming proposition and requires the involvement of a contractor in many such cases. Entryways should be from 32 to 36 inches wide with hallways at least 36 inches across so a wheelchair can be turned around. Threshold ramps can be very helpful in transitional areas where flooring surfaces are not even. They’re usually made of rubber and are easily adjustable to the height of the step or door jamb to be negotiated. Licensed contractors are trained in how to install threshold ramps to the correct height. An exterior wheelchair ramp may also be necessary for ready and convenient access to a home’s front door entryway. The bathroom is the site of most in-home accidents and should be carefully modified for a senior with mobility challenges to age in place safely. Bathing and toileting can be major problems for an elderly individual who has trouble getting around. To make bathing easier, a bathtub can be replaced with a walk-in or roll-in shower, which is considerably safer than a conventional bathtub. In some cases, a bathtub can be made safer for an elderly individual with grab rails and safety strips that prevent falls. Some seniors find a bathtub transfer bench preferable because it’s an inexpensive modification. It straddles the side of the bathtub, allowing the individual to be seated while lifting each leg, one at a time, over the side of the tub. Another option is to install a chair, which sits completely inside the tub. The toilet bowl should be from 17 to 19 inches off the floor for safe transfer from a wheelchair, with grab rails installed alongside for safety. Convenience and mobility can be a problem for aging seniors in the kitchen. Appliances may become difficult to reach and use and countertops and cabinets may be too high to reach, especially for someone in a wheelchair. Counter and cabinet heights can be adjusted by a contractor (many are experienced at making senior-accessible modifications), as well as the height of the sink. The microwave and other appliances may also need to be repositioned for ease of use. Falls are a major concern for seniors living at home. Six of 10 falls take place in the home and more than a third of seniors over 65 fall every year, so fall prevention is a major aging-in-place. Improved lighting, grab rails, and slip-proof mats are some of the most common means of preventing falls throughout the home. Technology and a thorough knowledge of what causes safety problems in the home are making it easier than ever for elderly individuals to age in place. Fortunately, many of the modifications that need to be made can be done inexpensively and without gutting the home. As long as an elderly individual’s comfort, convenience and, above all, safety are accounted for, aging in place is a possibility for many seniors. Residents of Alexandra north of Melbourne are fighting back against the takeover of their Anglican aged care facility by Bishop John Parkes (Diocese of Wangaratta). A Facebook page has been opened to allow residents and interested parties to express their view of what is happening and provide suggestions for a defensive action against the Bishop (Diocese). Concern has been expressed at public meetings in Alexandra that the move of the Bishop (Diocese) has more to do with rescuing a seemingly financially troubled Anglican aged care facility in Wangaratta.